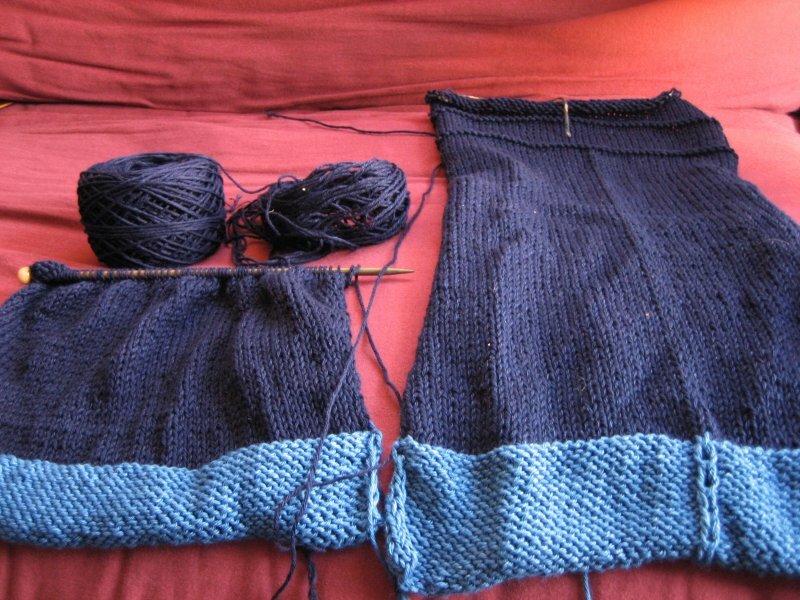 The Knitting Pirate » In Which the Pirate Remembers a Deadline. « In Which the Pirate Begins a Hat. In Which the Pirate Remembers a Deadline. My father called me this morning. Dad: Hi, toots! ** What's going on? Me: Uh.. you called me, Dad. Did something happen? Dad: No, I was just calling to say hi. Me: Oh! Okay good. I thought you were calling to tell me that the baby was born. Dad: No, not yet! But it will be Any Day Now. I could hear the significance and capital letters on Any Day Now, and it made me Very Very Nervous, also in capital letters, because the baby's pants are still not done. The baby herself is due on May 16, but we all know that due dates are estimates and not an exact science. She could be born tomorrow, or she could take another four weeks. Either way, I want those pants done - so I went into my room and looked at the projects on my desk. Most of a Pomatomus, part of a hat, half of a potential Knitty submission... and no babypants. "Okay," said I to myself, "this will not do," and now the babypants are on the desk but none of the other projects are. That doesn't seem like much progress - but they are also 35 rows larger than they were this morning. I have about 70 rows to go, then the finishing. They can be done in a few days. Tomorrow is the Sheep and Wool Festival. I may buy sock yarn or perhaps some laceweight, depending on what calls out to me and refuses to be left behind. Whatever I get, I swear, it will not distract me from these babypants until they are finished! I am project-monogamous from now until the end of these pants! Metachaos asked what hat pattern I am using - it is this Basic Hat Pattern from Mielke's Fiber Arts. I like formulas for hats for a number of reasons, primarily that the hat will fit me well regardless of yarn and gauge. The original Stellar and Tan hat was meant to be a Coronet, but my gauge was so far off with the Manos that I went with a plain toque instead. ** My dad has called me "toots" for years. I don't know why, or where it came from - but I like it. It's one of those things that only Dad can get away with calling me, and that makes it special. This entry was posted on Friday, May 4th, 2007 at 19:22 and is filed under babyclothes, blu, hat. You can follow any responses to this entry through the RSS 2.0 feed. Both comments and pings are currently closed.